New year and old traditions! Welcome to another Mish-Mash Monday. Ahoy maties! If you expressed interest in joining my seed swap in my preview post back in September, it's time now to officially sign up. Update: Sorry, the seed swap has reached capacity. In February, I quit my job to pursue Garden Faerie full time. In May, I attended the Garden Bloggers' Spring Fling and met old and made new friends. In July, I visited my niece in CO and the Denver Botanical Gardens. In August, I visited MOBOT, one of my favorite gardens ever (you didn't miss the post... I've been saving it for winter). In December, my blog was named one of Horticulture magazine's Top 20 Gardening Blogs. All year, I steadily removed buckthorn, large and small, from the south side of my backyard and at the end of the season had made some real progress. I went public about being a curbside shopper. I enjoyed the freedom to arrange my days to suit my own needs and spending more time in my garden. Cheryl, Esther, and Liz sent packages of British tea, which I'm still enjoying. Gail, Randy, and Shady sent me great plants (and Beckie, Linda, Lisa, and MrBrownThumb gave me seeds or plants in person). Genevieve sent Wicked Plants, which I won on her site, and some free items in a promo for her OpenSky store: 3 pairs of Atlas Nitrile gloves and a Fiskars soil knife that I adore. You might even say putting your best foot (or paw, as the case may be) forward! Hyuck! I'm in town all week. My biggest goal for 2010 is mundanely mature: I need to find stable employment. I've loved my near year of being the Garden Faerie (speaking, teaching, gardening, garden coaching, and garden writing), but the reality is, it can't support me in the long-term. I've worked over 20 years in corporate communications (technical and marketing writing, editing, and web content management) and am looking to draw on those skills to move in a slightly new direction. Possibly user interface design, project management, or instructional design/training. I don't know how realistic a change in career focus is in the Michigan economy, but I'll soon find out! The east and south side of my backyard borders on a nature area, so my snow never stays pristine long, as various furry and feathered friends make their way to my feeders. and ducks! I love their tracks! *I swear Yosemite Sam once said "Who put footyprints on my nice clean desert?" but can't find the sound file. Good luck with the job hunt. I know you have many talents. Love the snow tracks. Since we did have six inches in the past few days, the birds are busy at the feeder. I have to put up a couple more. Goal for today! Squirrels are also galloping around. They sound so loud on the roof. 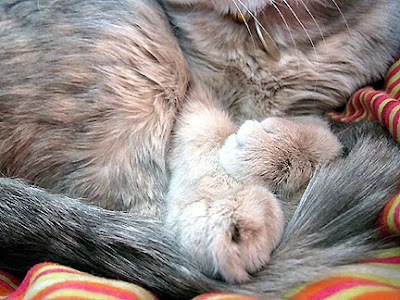 Those are some cute furry paws! I've been trying to identify the tracks in my snow, but after I tromp all over the yard with Sophie on her leash, it's hard to see anything but our prints. Lots of birdies, though. I think you really took advantage of your year off, Monica--you visited a lot of interesting places. Good luck with the job search; with all your talents, I'm sure you'll find something soon. I hope you find a new job that you can really enjoy! because You are such a talented individual. Many of us working out here for others are working for servival, but don't enjoy what we do for a living. 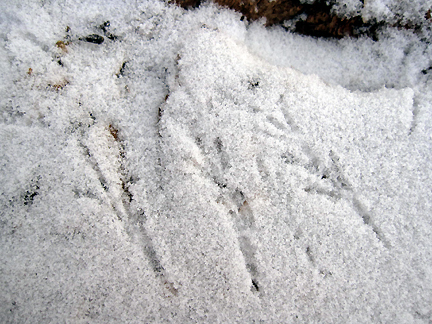 Love the photo's of the animal tracks in the snow for some reason photos like these always make me laugh! Hi Monica, it's a bummer to have to go back to work. Good luck with the job search. Love your new header. Congrats on the Horticulture Magazine recognition! I squeaked when I saw the Squirrel prints. Ah, Squirrel my favourite word of all (well alongside both wibble and wobble) so rare to see them here. Best of luck in your new adventures but whatever happens keep blogging away please! Hi you two! 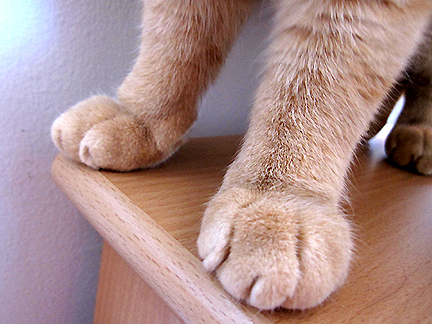 We love your pawsies, they are adorable. Happy New Year to you and to your mom! It's a bit sad that reality is stubborn and forces your mom to go back to a regular job. We cross our paws that she'll find a cool employment soon. Good luck Monica with the job hunt. I have a feeling that you will find something without too much of a problem. You will do great at whatever you choose, I'm sure! My feeders are really busy too, our wind chills have been in the negative teens! You are an amazing woman (with many gifts) who has enjoyed a wonderful year, Monica! Good luck in this waning economy ... I know many who are challenged but optimistic. 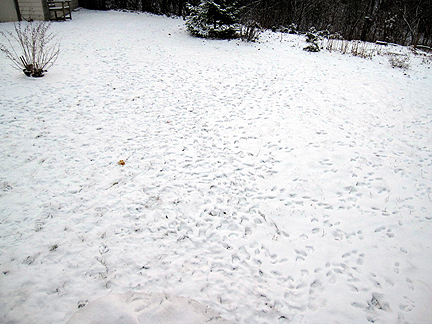 (Think we saw bear tracks in our yard at the lake ... and, dah, why didn't I take some photos)! Monica good luck in your job search. You've had a very interesting year! It sounds like you definitely made the most of your near year of being Garden Faerie. Monica, as I said way back a year ago, go for it girl! I was very proud of you for taking such a big step-nothing ventured... and so forth. You would have always wondered had you not pursued your dream. I think you did very well. And now, life takes another direction-who knows where the path will lead you. So, GO FOR IT GIRL! It has been nice getting to know you. You crack me up. I'm glad I saw this post because I've been looking at the snow tracks in the alley behind the house and have been disgusted with the idea that those giants prints are from humongous rats! They could be squirrels, that's what I'm going to tell myself when I take the trash out after the sun has set. Those giants tracks are squirrels, yes-that's it. Squirrels. We've had 4+ inches of snow today, so all our tracks are wild teenagers! Good luck with job hunting - with that resume you should be able to get a really good job - just make sure you get one you'll enjoy! A good idea to take stock Monica. It sounds as if 2009 was a great one for you. Good luck with your job search - I am sure that you will put a great cv together and that employers will be throwing themselves at your feet. Congratulations on getting into the top twenty blogs! Liebe Monica, herrliche Misch-Masch-Katzenfüße hast Du fotografiert. Das sind wirklich ganz tolle Bilder. Die Spuren im Schnee schaue ich mir auch immer gern an. Manchmal vergleiche ich sie anhand eines Tierspuren-Buches. Entenspuren hatten wir jedoch noch nicht, jedenfalls nicht im Garten. I haven't forgotten about your question re mushy peas - I'm going to do a whole post on it especially for you. I've found some great stuff! WV says joyering which sounds like just the right kind of NY resolution to keep - spread some joy thru' blogging just like you do. Good luck with the job hunting - it sounds like you have some great ideas for a new direction whilst exploiting the skills you have to the full. Go for it girl! I love your kitty photos Monica! Good luck on the job hunt. If you're serious about project mgmt jobs you should probably get your PMP certification. It's being asked for more and more (I've been looking for PM jobs myself). All in all it sounds like you had a great 2009 - congratulations! This site has the wav file you were looking for. Click on the image of Yosemite Sam on the right bar then scroll down to the file. 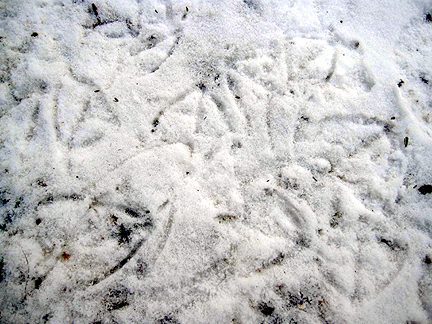 Duck prints!! It worries me to think of poor little webby duck feet getting so cold, but I suppose they know what they're doing :) I found mouse tunnels in my yard earlier this winter, am kicking myself for not getting a picture before the dogs blustered through and ruined the snow. What a great 2009 you had! I know you will find a great job this year, as multi-talented as you are. Hi Monica, congrats on the Horticulture kudos!!!! How exciting! 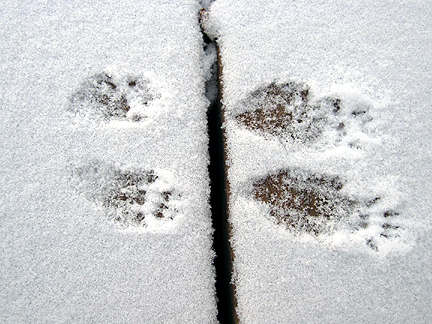 I love the photos - the kitty paws and the wildlife footprints. Speaking from experience, it's tough, if necessary to contemplate returning to a traditional job after being one's own boss. Hopefully with the renewed interest in gardening, over time those of us with the passion for it will find a financially sustainable career in it. And, let's all hope the job market will continue to improve in coming months. Good luck and best wishes on a successful, and as brief as possible job search which results in finding something you'll love. Und was bitte heißt "Mish-Mash Monday" aud deutsch??? Ich wünsche dir einen guten Start ins Neue Jahr, liebe Monica. Hi furriends! You are right, the orange/yellow bottom of the kitty bed is a crocheted piece. Mom wanted to learn how to crochet and did it. Ah! Good! I've arrived. I read your post yesterday, Monica, but my computer struggles to load the page and I couldn't get onto comments then at all. These Mish-Mashes provoke so many thoughts but the most important is clearly to wish you specially well for the coming year. I hope you enjoy this phase of life to its full and enjoy all your dreams simultaneously before you find out which ones are fulfilled.